Rick Bayless is an amazing chef specializing in Mexican cuisine. He lived in Mexico and studied their culture and food for 6 years. Bayless is known for his PBS series Mexico: One Plate at a Time. He also started 3 amazing restaurants in Chicago dedicated to tantalizing our taste buds to authentic Mexican cuisine. Frontera Grill was Bayless’s first restaurant which I would describe as a comforting, colorful space abuzz with conversation, strong margaritas “on the rocks” and perfect regional Mexican meals. A few years later Bayless opened Topolobampo right next door to Frontera Grill. Topo (which is how the ‘in’ people refer to it) was a first in Mexican fine dining in the USA. Topo is mucho popular and customers typically start lining up around the building before it opens to get a spot! As if two fantastic Mexican restaurants right next to one another weren’t enough…Bayless recently opened a third to complete the lineup on State Street in Chicago. Xoco is a nod to Mexico’s street food. A cafe style space offering fresh fried churros, steamy bowls of caldos, spicy homemade hot chocolate, melt in your mouth empanadas, filling tortas and other street food delights. An exciting side note on this place: After seeing the Broadway show Wicked I dined here and actually saw Rick Bayless in the kitchen tasting the caldos!!! My eyes lit up, my heart was warmed and perhaps sensing my excitement he nodded to me and I was fulfilled without even eating! Here is a link to EVERYTHING Rick Bayless. His website is filled with great recipes and his restaurants–I recommend ALL OF THEM! The other day I was shopping at my local Meijer and saw that they had fresh-baked pretzel buns. Knowing just how great a pretzel bun is I bought a pack. When I got home I decided to make hamburgers but I didn’t want ‘just a burger’ I wanted a burger that had something special! I was perusing some cookbooks and came across Rick Bayless’s Queso Fundido Burger. Roast the poblanos over an open flame or 4 inches below a broiler, turning regularly until blistered and blackened all over, about 5 minutes for an open flame, 10 minutes for the broiler. Place in a bowl, cover with a kitchen towel and let cool. Rub off the blackened skin and pull out the stems and seed pods. Cut into 1/4-inch strips. Heat the oil in a medium skillet over medium. Once the oil is hot, add the onions, stirring frequently until it begins to brown, 7 to 8 minutes. Stir in the garlic and poblano and cook for 2 minutes. Season with salt, usually about 1/2 teaspoon. Scrape the rajas into a bowl and cover to keep warm. In a large bowl, combine the ground beef, cooked chorizo, chipotles and 1 1/2 teaspoon salt. Mix until well combined. Divide the meat into 4 equal portions and form the patties. Heat a gas grill to medium-high, or light a charcoal fire and let it burn until the charcoal is covered with white ash (and about medium hot); bank the coals to one side. Place the hamburger patties on the grill and cook for a total of 4 to 5 minutes for medium rare. Lay one piece of cheese on top of each burger, top with the warm rajas and then another piece of cheese. Close the lid and continue cooking until the cheese has melted about 1 minute. Remove from the grill and place on a toasted bun. Serve immediately. 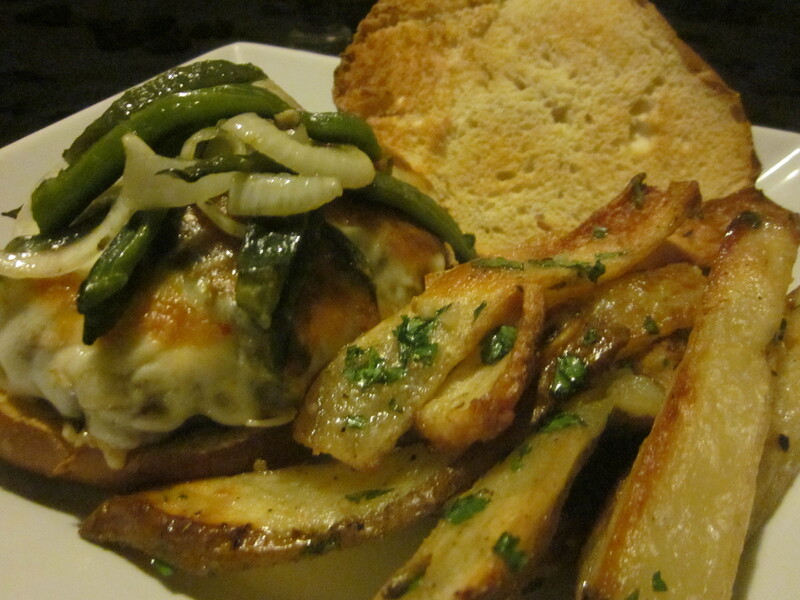 Queso Fundido Burger and Garlic Frites, photo by michelle. I served them with a side of Garlic Frites which are pretty simple and oh so good. Wash and scrub potatoes clean. I don’t bother peeling them…peels are good for you! Cut into long sticks and coat with olive oil, salt and pepper. Place on greased baking sheet and bake about 40 minutes turning every so often until golden brown. In the meantime, in a separate bowl mix olive oil chopped parsley and fresh chopped garlic. When the fries come out of the oven toss them in the bowl of olive oil, parsley and garlic until coated. Serve! Posted on October 9, 2011 October 31, 2017 by Table Without BordersPosted in RecipesTagged bbq, burger, Chorizo, cookout, Frites, Garlic, hamburger, Latin, Mexico, Queso Fundido Burger, Rick Bayless.